How is this detox program different from others? Where do I buy the products for this detox program? What if I can't find a certain product/ingredient in my country? I have a question, who do I email? Should I continue taking my usual herbs/supplements during the detox -- including during the liver cleanse? I'm breastfeeding or pregnant – is this detox safe for me and my child? Can children detox? 1. How is this detox program different from others? The road to natural health begins with cleansing and detoxification -- no matter what the disease or problem. The Baseline of Health® Foundation's Natural Detox Program uses the tools Jon Barron learned from the "miracle doctors" in his life. Click on the following link to read an article in Nutritional Wellness magazine about Jon Barron's natural detox program. 2. Where do I buy the products for this detox program? Jon avoids making brand recommendations for these formulations for the simple reason that it's impossible for him to track all of the thousands of available alternatives, or to continually monitor the ingredient sourcing and manufacturing procedures for all of the various companies. There are, however, a few notable exceptions. First and foremost is www.baselinenutritionals.com where you will find detox products that support this program, as well as a few detox "kits" that puts all products together to make purchasing easier (and offers a special kit discount). NOTE: Baseline Nutritionals® carries all of Jon Barron's exclusive formulations described in the Barron Reports. Baseline Nutritionals®' high-quality products was awarded "2006 Nutritional Supplement Company of the Year" because their formulas incorporate: USP grade nutraceuticals, organic and wild crafted herbs, and third party testing to guarantee optimum potency and efficacy. Baseline Nutritionals® offers a 100% guarantee on all their products. 3. What if I can't find a certain product/ingredient in my country? If you like another company's formulas better, or you find them more readily available, feel free to use those -- but be aware that you will have to adjust to the instructions that come with those products. Our Barron Report Archives will help you understand what to look for in those natural detox formulations. 4. I have a question, who do I email? Please email us using our contact form. 5. Should I continue taking my usual herbs or supplements during this natural detox program - especially during the liver cleanse? 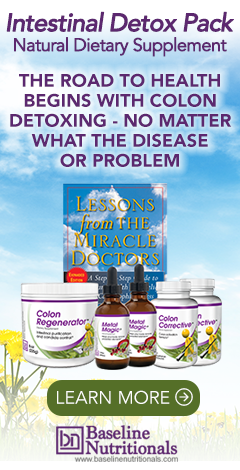 During the colon detox, you can continue to take all of your supplements. When it comes time to do the liver detox, Jon Barron suggests giving your body a rest and using just essential supplements. If on medication, please consult with your doctor. 6. I'm breastfeeding or pregnant – is this detox safe for me and my child? Can children detox? Cleansing and detoxification is not recommended while breastfeeding, if pregnant, or for children. It is not recommended while pregnant because it may temporarily release toxins into the bloodstream, which can then make their way to the fetus. If breasfeeding, toxins can make their way into the milk. The odds are minimal that it would be a problem, but it's still best to wait until you finish breastfeeding before doing a full detox. I have completed the colon and kidney detox and am on day four of the liver and blood. I have started experiencing abdominal discomfort and blood in my stool and was wondering if that is something I should be concerned about? Congratulations Paige on your progress! This question was answered on our FAQ page in the Colon Detox section: "Rectal bleeding (unlike internal bleeding) is normally an insignificant condition -- similar to a bloody nose. It occurs due to a preexisting colon condition that leads to constipation and straining. As Colon Corrective wakes up the system and breaks apart toxins and build up, a few drops of blood may appear -- looking quite dramatic as they spread through the water. (Internal bleeding, on the other hand, is characterized by black or dark purple stools. If you experience internal bleeding see your doctor immediately.)"